If I'm making on average 11 tacos per week, frying the corn tortillas myself, I'm saving 66 cents on taco shells each week, or $34.32 per year, over buying a 10-ct box of pre-made shells, each week, for $1 at the grocery store. The only problem with frying packaged corn tortillas is they seem to split when you fold them in half. There's a way around that, though. Here's how I fry my taco shells. The shell to the left is the one I'm softening, so it won't crack at the fold. The one on the right is a filled taco frying. To start, I put some oil into a skillet and heat over Medium. When the oil is hot, I take a flat, corn tortilla, and pinch two opposite edges, loosely. I hold the tortilla so the bottom of the fold, only, is in the oil. I hold here for 60 seconds. 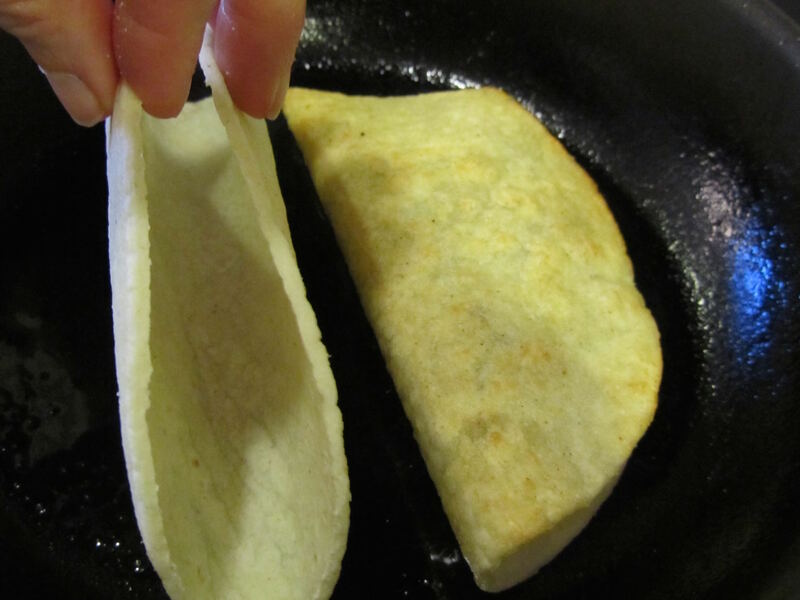 This softens the tortilla and makes the fold flexible so it won't crack. 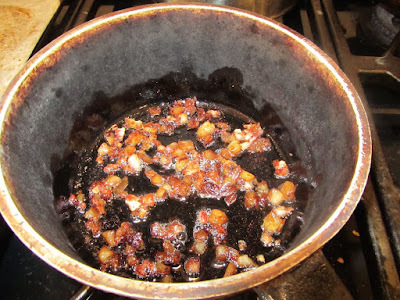 Then I remove the tortilla from the oil, fill with my beans/rice and or meat, and return to the oil, to fry on each side. There's enough room in the skillet for me to be frying one taco, while I softening the next taco shell to be filled. It all goes very quickly, taking about 30 minutes of frying time for 12 tacos. Anyways, when I'm looking to cut grocery costs, I break down the price on different menu items, including all expenses to make the item, and compare to my available options. Frying your own taco shells might not be as advantageous for you, as you may pay more for tortillas and/or oil than I do. Or maybe you do a lot of couponing, and can buy ready-made shells for what my cost is in making them. You would have to do the cost comparison with your own prices for the tortillas, oil and energy used by your stove. Sometimes, I do one of these cost breakdowns and I find making a food from scratch is not the most economical. Making my own tomato paste from store-bought tomatoes was one item that was more costly to make than to buy. It's worth it to do the calculations, so I can make informed choices. FYI -- we rarely have meat-filled tacos. 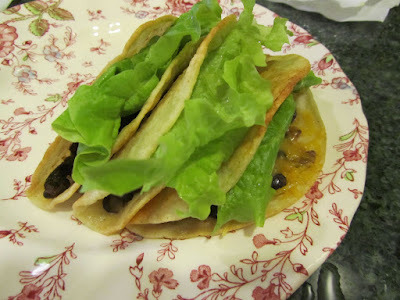 Most of the time I use refried beans, leftover beans and rice, or as in these tacos, seasoned black beans with olives. Then I add cheese, lettuce, tomatoes (if we have any) and salsa. Our tacos this last week cost about 85 cents for 10 tacos -- a bargain supper. Those tacos look really yummy. We have tacos about once per week also but we mostly have a meat filling. I don't often buy crunchy shells and we like soft tacos instead. I don't make my own either just because of time issues. I do, however, like corn tortillas but mostly my family like flour tortillas. I heat mine up on my gas range flame and when they are soft, quickly fold them in half and that's good enough for me. We use light meat filling and then heavier on the lettuce, salsa, refried beans, cheese or whatever they want on them. We'll probably have them tomorrow since that is a busy day for me and the kids can put that together themselves. I'm running out of supper ideas. I have a lot of ground beef, ground pork, chicken legs and thighs, and pork roasts and pork steak. No beef steaks or roasts. Thankfully, I can easily throw something together at the last minute without too much thought and without a recipe. Kids come home about the time I come home while one leaves for school shortly after I come home for a night class. Hubby is back to work so he can't do too much to help. I try to make enough for leftovers but somehow I rarely have leftovers! I guess I got used to cooking for three! We haven't died of starvation yet. I used to makes something with ground beef that was super quick and might work for your family. I'd brown the ground beef, drain the fat, put the meat back into the pan with frozen broccoli and cook a bit until tender. Then I season with garlic powder, soy sauce and black pepper, nothing else. Serve over rice. We ate that a lot when my twins were first born. I had zero time and even less energy to cook dinner, but I could do that, and it was good and filling. It sounds like you've got a busy household this summer. It will all work out, I'm sure. Different appetites, I guess. Plus both my son and husband have sedentary jobs. I typically make 3 tacos each for them, have 1 myself, then 2 for each of my daughters. If there's one extra, the men split it. What do you make that fills the men up? I serve a lot of brown rice, here. It's inexpensive and calorie dense (200 a cup, before adding extras like butter). If my husband hasn't been eating enough, or I find I didn't make enough dinner, I add a scoop of leftover rice to his plate, and top with butter, or oil and salsa (plus maybe a side of seasoned beans, if we're having Mexican). You know, my son never went through a period of bottomless pit appetite as a teen. 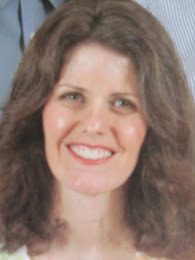 He ate as much as my husband, but never more. I could never eat a whole lot, without gaining weight, as a teen either (and still probably don't eat all that much). So, metabolisms are likely genetic. Cheryl, it could also be that my family eats a lot throughout the day. I know that I do, and so does my son, where his work provides restaurant food every day, and they have an extensive pantry full of snacky stuff available. Whereas, for your family, dinner may be the largest meal you all eat every day, which could account for needing more food at that meal. It's hard to compare one family's intake to another's, I think. I have a nephew who won't eat brown rice, either. I think it's what a person grew up with. My kids have never eaten much white rice, because I've only bought the brown rice. Of course, they think it's such a huge treat to have white rice in a restaurant! We don't eat through the day. With do a I really need to watch. Breakfast, lunch, afternoon snack, dinner, after dinner snack. I am allowed 1 oz. of carbs at each snack. Doesn't give a whole lot of chips. I act live brown rice more than white now. Just taste better to me. Cheryl. Ps. You're right every family is so different. Suppose to be with diabetes not do. Type to fast on the kindle. So clever, Lili! We eat tacos about once every other week. We leave for vacation Sunday--we are staying in a condo with a full kitchen, so I plan on taking some pre-cooked, reheat-able foods--tacos is definitely one of my go-to meals! I hope you'll have a wonderful time on your vacation! Will you be near hiking and fishing opportunities, or is this a city-type of vacation? And I'm so glad you're not planning on a lot of cooking from scratch while you're on vacation! Kris, it sounds like you'll have a lot of fun. I like your method of JITB style taco cooking, never thought of doing it that way at home for ourselves. Also my husband doesn't like the hard taco shells that come in a box and I dislike how it breaks so easily when trying to add the fillings into the shell. Yesterday, we were at Target looking at their El Paso sale (buy 2 or 3? and get free taco seasoning mix), plus 30% cartwheel, plus .50 off coupon each, and still couldn't pull the trigger on buying the hard shells. Making our own might be the solution, although we love flour tortillas any day, and I'm guessing that it might even be cheaper than bought corn tortilla?? Not sure. Do you have a price comparison for this handy, home made flour tortilla vs corn tortilla, assuming 2 corn = 1 flour, as far as consumption? I don't know how much I could buy corn tortillas in our stores, since I hardly purchased it if ever at all. Costco would probably have a good price on corn tortillas. But also, if you have any Latino markets, that's where I've seen the lowest price on large bags of corn tortillas (but you have to buy 5 bags at a time, so I get them at WinCo instead). Anyway, homemade flour vs. corn tortillas -- depends on how big you make your flour tortillas. Corn tortillas have 50 cals a piece. If you use 1 cup of flour plus 2 tablespoons oil to make 4 large tortillas, your calorie count would be about 170 each tortilla. So, it could take 3 corn tortillas to equal 1 flour one. But if that were the case, then 1 flour tortilla would cost me about 4 cents, not fried, compared to 9 cents (for 3 corn tortillas), not fried. But I don't necessarily look at it as a flour vs corn tortilla equation. The corn tortillas give us variety, instead of eating a whole lot of wheat products, we try to eat some rice and some corn, too. So, it's more like -- what costs more a corn tortilla or some other corn product, like polenta or cornbread? Polenta is the cheapest, if I don't use butter or olive oil, but use chicken fat for the fat portion, then whatever milk I'm currently using, plus herbs, garlic, and homemade stock. And the other thing with corn vs flour tortilla, in our house, a corn tortilla makes it a taco, and a flour tortilla makes it a burrito, in everyone's minds. The good thing about corn tortillas, though, should you want to go that route -- they keep refrigerated for a very long time ( a couple of months). 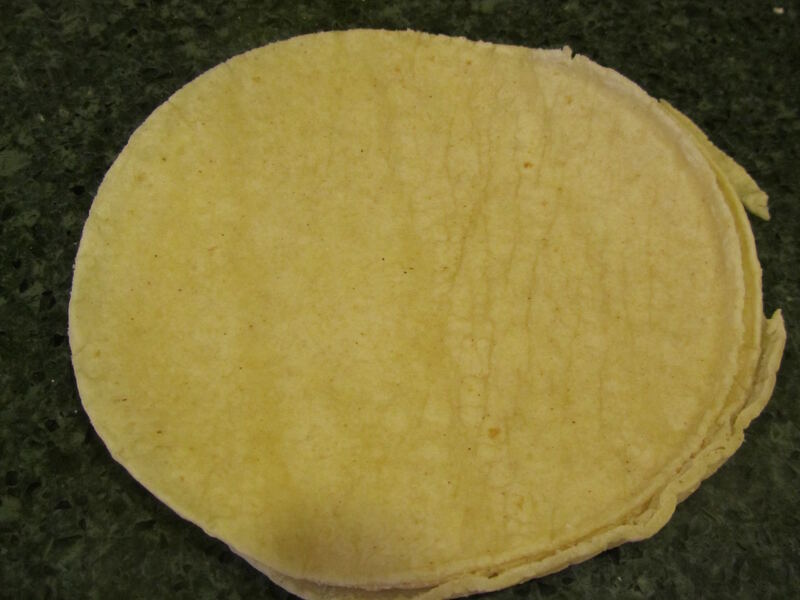 Compared to commercial flour tortillas which go moldy after a couple of weeks. since I am the only one that like corn tortillas I keep them in the freezer. They are pretty easy to separate so that is where they stay. I had no idea they were that much healthier than flour ones. That is quite a big difference. Now you're making me hungry for tacos tonight but I really need them tomorrow for when I'm gone all day and all night. I guess our flour tortillas are eaten burrito style too...or like a soft taco. I like the easy prep, just thaw in the microwave directly from the freezer. No frying in oil. But like you said so well, there are other considerations like having more corn in one's diet. For us, since I'm watching carbs, 1 flour tortilla (around 25g carb) is about equal to 2-3 corn tortillas (11x3g). I never noticed corn tortillas at Costco, and I just checked Sam's Club online and they don't sell it here. I think I've seen it at Safeway, and supermarkets. There are no Mexican markets on the islands. But interestingly corn tortillas cost 2x homemade flour tortillas for you, so it will be at least double that (4x or more) for me. But I still like your method of frying the filling with the corn tortillas and I might try it just for introducing menu variety. Alice, on the flour tortillas, the calorie count all depends on the size, and flour tortillas come in more sizes than corn (at least in my area). There are the small fajita-size ones -- can be around 110 calories, but the burrito size ones are as much as 200 cals! If just looking at calories, I can eat 4 corn tortillas for the same cals as 1 burrito-size flour tortilla. That sounds like it works well, and especially for making the shells as a separate item, to fill after frying. I love tacos, too. Always a hit when I make them!